For this segment of Amazing Audiobooks, I’m focusing on the behemoth novels that fill up disc after disc of listening material. These exciting, immersive *bugcrushers will eat up time spent on the road, on the treadmill, or doing chores – listen while you cook dinner or fold the laundry; listen when your knitting needles click or break out your headphones when you want to keep reading but your partner insists on lights out! 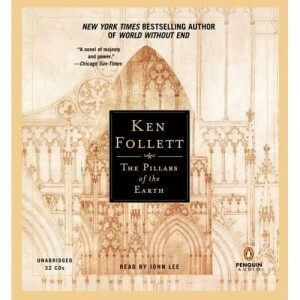 The Pillars of the Earth by Ken Follett, read for you by John Lee: A beloved gargantuan novel of the people building a cathedral in 1100s England – filled with mystery, suspense, rich historical detail, and captivating characters. This 32-disc novel is a winner! Its sequel, World Without End, is similarly enthralling. 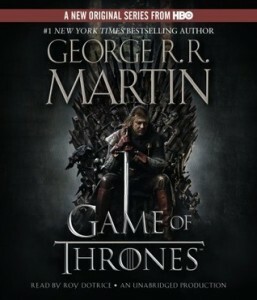 A Game of Thrones, written by George R.R. Martin and masterfully performed by Roy Dotrice. This single novel takes up 28 CDs, or 33.5 hours. More than enough for the usual road trip! The four sequels to this novel are each around 30 discs of listening material, which would supply your listening needs long enough to drive from Davenport to Orlando Florida and back – three times! 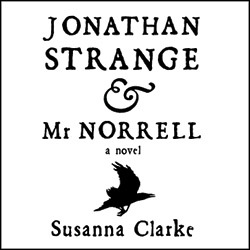 Jonathan Strange & Mr. Norrell, written by Susanna Clarke and performed by Simon Prebble, is a fantasy novel that answers the question: what if a society of proper London magicians were around to magically assist the armies of England in the Napoleonic wars? And what if the leaders of that group were fighting against each other as well as taking on malevolent forces from the realm of Faerie? And what if all of this was written in a superb Jane-Austen-esque style that evokes all the sparkling wit and manners of the times without sacrificing the edge-of-your-seat action that modern audiences expect? Or, to put it more simply: This is an amazing novel and you should listen to it or read it right away. 32 hours of listening pleasure on 26 discs. *Bugcrusher: A book that is so big and heavy, you’d like to have it in hand to squish a scary bug.